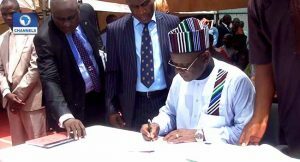 Governor Samuel Ortom of Benue State has signed the Open Grazing Prohibition Bill 2017, which prescribes a five-year jail term for herdsmen or pastoralist caught engaging in open grazing of animals in the state, into law. Open grazing has been blamed for the frequent clashes between farmers and herdsmen, which has claimed hundreds of lives in the state. The governor signed the bill into law at a stakeholders meeting at the Government House in Makurdi. “The law brings an end to the incessant clash between livestock/herds rearers and crop farmers in the state, who in attempts to protect their respective interest, clash, kill maim and destroy persons and properties,” Governor Ortom said. Also, under the law, the governor said it would be illegal for livestock owners or farmers to bear firearms. Governor Ortom also signed the Anti-Kidnapping and Terrorism Law, which prescribes the death penalty for offenders. At the stakeholders meeting, many speakers, including the Tor Tiv, Professor James Ayatse, and Senator George Akume, backed the governor and the law. The Parish Priest of Saint Francis Catholic Church, Daudu, Reverend Father Solomon Mfa, who was displaced by herdsmen in 2014, thanked the governor for bringing consolation to many internally displaced persons by signing the bill into law. He said, “With all sense of fulfilment, we have seen the promise land and all that is left is to enter the promise land which I feel will be done if this (law) is implemented. Meanwhile, representatives of the herdsmen in the state have appealed for more time to enable them to establish ranches, while citizens hailed the state government for addressing the issues of insecurity. The representative of Fulani herdsmen, Mr Garus Gololo, said, “He (Governor Ortom) said he is not driving the Fulani away from Benue State, unlike what other people have been speculating, hence the issue of ranching. For many families in the state, signing the bill into law a step in the right direction, but the successful implementation is key to the return of peace to the state.